Confirmation is a public statement of belonging to the Christian Community. It is a rite of passage to confirm, strengthen, establish and secure the person in their Christian journey. As it is secondary to baptism, it is a way for those who have been baptised to affirm for themselves what was done for them at their baptism, if that took place when they were an infant. If they were baptised as an adult it is perhaps more of an underlining with prayer of the choice that person has made to undertake a journey of faith. It means the strengthening or deepening of one's Christian belief and the admittance as a full member of the Church. Whatever your age, if you are interested in being confirmed, look out for details of confirmation classes and/or contact the office to discuss preparation and confirmation at St James's. Locally, confirmation takes place in rotation between St James’s and the two neighbouring Hampton parishes of St Mary’s and All Saints. Candidates prepare for confirmation at their own church and attend for confirmation at the church that is hosting for that year. 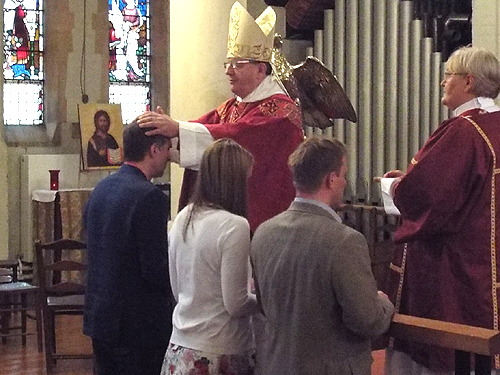 The key outward sign at a confirmation service is the laying on of hands by a bishop signifying the Holy Spirit coming down upon that person, and the touch of God upon that person’s life. The bishop may also anoint the person with oil. To prepare for confirmation candidates usually attend classes, to look at the basics of Christianity and also to learn about the Holy Communion Service and what it means. This is an important time for young Christians to learn about the commitment that being a Christian involves. They may have been baptised as a baby but in the confirmation service they are old enough to renew the promises and the expression of faith made on their behalf when they were baptised: to believe in God, to be a member of the Church, to avoid sin and lead a moral life.